Market corrections are often seen by retail and professional investors as an opportunity to acquire quality stocks at a bargain price. Investment trusts have considerable flexibility to take advantage of these situations because they can borrow money to invest, creating a larger pool from which to earn dividends or generate capital gains. Borrowing to invest is also known as gearing up (or in other words increasing the proportion of debt to equity) and in a rising market it can help to boost returns. Equally it can work against investors when markets fall by adding to the short-term volatility. It also means fund managers do not have to sell holdings they still like if they have other investment ideas they want to action. There are different ways in which a fund manager can gear up a portfolio including bank debt, loan stock, debentures, foreign currency loans or preference shares. 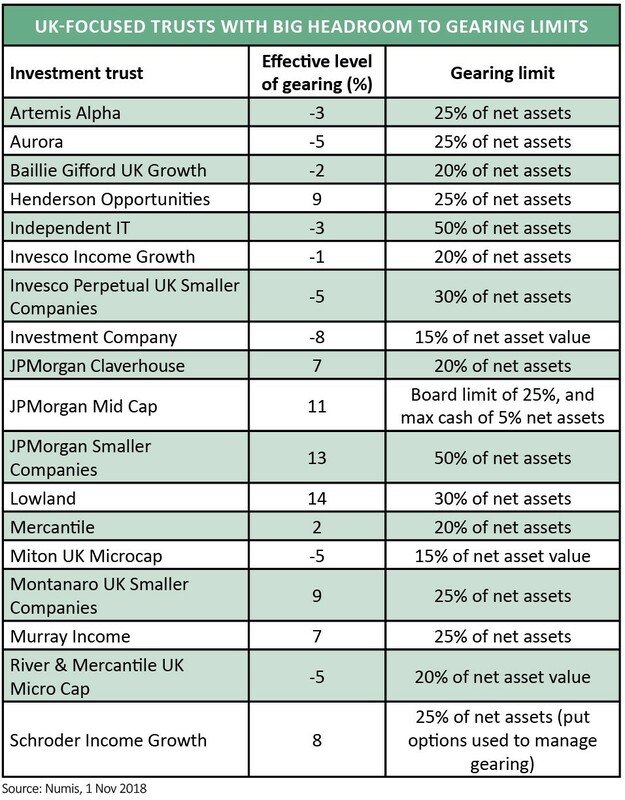 Many trusts set strict in-house limits on how much gearing they can employ, typically a percentage of their net asset value and often pitched at between 25% or 30%. In reality, many trusts will borrow a much smaller amount and some none at all. Some fund managers will reduce gearing when they believe we’re heading towards more difficult market conditions. For example, JP Morgan American’s (JAM) Garrett Fish said in October 2018 that the current market conditions warranted a ‘revision of the tactical gearing level to 0% plus or minus 2% from the previous level of 5%’, effectively cutting the gearing level to zero. It is worth pointing out that US stocks had performed particularly strongly in the run up to the recent volatility and many observers had suggested valuations had reached unsustainable levels. In contrast many London-listed shares have lagged behind the US markets and so some fund managers are looking to take advantage of recent price weakness by deploying more money in this market. In this article, we examine which domestic-focused UK trusts have the capacity to increase gearing, as well as talking to some managers about their investment plans. 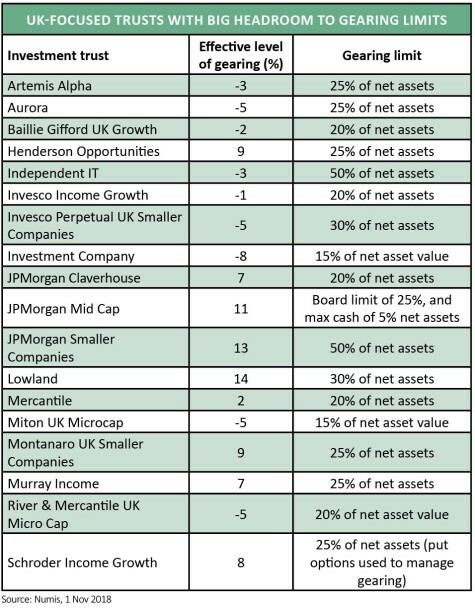 The accompanying table, based on data from stockbroker Numis, shows a collection of trusts with considerable headroom within their agreed gearing limits. It shows their ‘effective’ level of gearing which strips out any cash the trust is holding. It is worth pointing out that some trusts may have access to undrawn facilities which are not included in these numbers. Charles Montanaro, who manages investment trust Montanaro UK Smaller Companies (MTU), notes gearing in his trust was negligible at the end of the September. Yet he expects gearing on the trust to reach between 5% and 10% by the end of the year. ‘October has been remarkable: the UK small cap sector fell 7.3%, the worst month in over six years; AIM had its worst month since October 2008; and UK small cap is now at the lowest valuation since November 2012. Experienced manager James Henderson tells Shares he is planning to increase gearing on three of the trusts under his charge, seeing particular opportunities among smaller companies. He says gearing could increase at Law Debenture (LWDB) from effectively zero to between 8% and 12%; on Lowland (LWI), where he says, ‘we don’t move it around a great deal’ potentially up to 20% ‘on weakness’; and on Henderson Opportunities (HOT) up to 15% ‘over time’. The fund manager also notes that while gearing can increase volatility, income stocks tend at the outset to be lower beta or less volatile than the wider market. While he concedes that you do need to be ‘really careful’ with gearing, he sees little chance of higher borrowing rates becoming an issue in the near term as they were for trusts which used relatively expensive debt to invest in the 1990s. Other managers, with a remit which goes beyond the UK, are also looking to take advantage of the recent market weakness. For example, the co-manager of JP Morgan European Smaller Companies (JESC) Francesco Conte notes his trust has the discretion to be 20% geared or 20% in cash. It has operated at either ends of this extreme over the two decades he has been involved and until recently the trust had a small cash position after reducing gearing earlier this year.